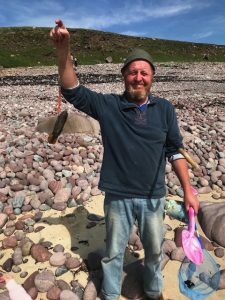 Manx Basking Shark Watch | “DEREK’ THE BASKING SHARK’S SATELLITE TAG IS FOUND! “DEREK’ THE BASKING SHARK’S SATELLITE TAG IS FOUND! GREAT NEWS! Last night I got an exciting message from David Hall (no relation) in the far Northwest of Scotland. He had found a satellite tag from one of our sharks near Raffin on the Point of Stoer, Lochinver. He saw the writing on the tag’s tail fin and realized that it was one of our basking shark tracking tags. David very kindly contacted me via the Manx Basking Shark Watch webpage. When we checked the SPOT tag’s number it turned out to be from a large male basking shark that we had tagged in 2016. We had nicknamed him ‘Derek’ after my father who was crewing on the Manx Basking Shark Watch research boat ‘Happy Jack’ that day. David says, “Myself and my wife June run a small croft on the point of Stoer ten miles north of Lochinver north west Scotland, my son and family had come to stay and as it was a grand day we took the girls down to the beach, and while beach combing among the junk washed ashore we found what was first thought to be a fishing lure of some kind but after a wash in the sea and closer inspection found it was a Manx basking shark tag. Over the years here we have seen many basking shark from the croft and always an exiting creature to see so it was nice to be involved if only in a small way with such an important study of a welcome visitor to our small bit of the world.” David very kindly declined the £50 reward for finding the tag and asked us to put the money straight back into the charity funds.